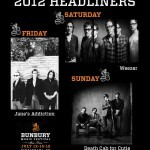 Don’t miss the Bunbury Music Festival the second weekend in July! For three days, this celebration will include major music acts, an eco friendly marketplace, and a battle of technology start up companies! Yes, I said “ a battle of technology start up companies.” This unique festival is great for rockers, tree huggers, and geeks, who will be converging on downtown Cincinnati in the thousands from July 13-15. 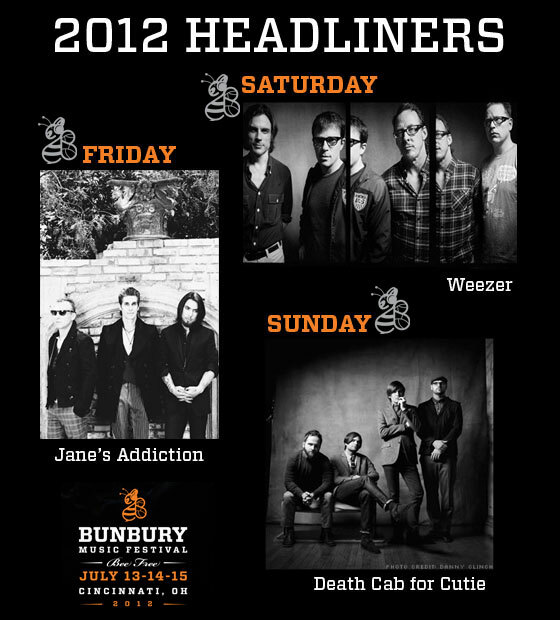 As the Bunbury’s website details, there are quite a few bands to see, especially some big named ones like Weezer, Death Cab for Cutie, and Janes Addiction, the festival’s headliners. Beginning on Friday, Jane’s Addiction takes the stage along with Airborne Toxic Event, Minus the Bear, O.A.R. Foxy Shazam, Ra Ra Riot, LP, Crash Kings, Henry Clay People, Matt Pryor, Reverend Peyton’s Big Damn Band Ponderosa, Chappo, All Get Out, Kids These Days, Capital Cities, Madi Diaz, Quiet Coral, The Minor Leagues, Find Vienna, Lauren Mann and the Fairly Odd Folk, Pet Clinic She Does Magic, Bo & The Locomotive, Tristen, Humble Home, Emily & the Complexes, and G. Miles and the Hitmen. On Saturday, the line up includes Weezer, The Gaslight Anthem, Manchester Orchestra, Grouplove, RID2, Dan Deacon, The Bright Light Social Hour, Jukebox the Ghost, Imagine Dragons Alberta Cross, Kevin Devine, A Silent Film, The Silent Comedy, Graffiti 6, 1, 2, 3, Secret Music, The 4on the Floor, Masserly & Ewing, 500 Miles to Memphis, Lions Rampant, Jeremy Pinnell & the 55’s, Wheels on Fire, Hotfox, Sphynx, Doop and the Inside Outlaws, Old Lights, Black Taxi, and the Sundresses. Sunday rounds out the musical performances with Death Cab for Cutie, Passion Pit, Neon Trees, Guided By Voices, City and Colour, Margot & the Nuclear So & So’s, Good Old War, Lights, Will Hoge, Maps & Atlases, The Deep Dark Woods, YAWN, Now, Now, Nikki Lane, UME, Wussy, Pomegranates, Seedy Seeds, The Tillers, Child Bite, Archer’s Paradox, Belle Historie, Arlo McKinley and the Lonesome Sound, Black Owls, The Black Tape, and Rachel Ann Figley. Throughout the festival, ticket holders will also be immersed in the green life. The community marketplace is an eco wonder with sustainable products and services for everyone, as well as information about positive things people can become involved in to help make a difference. At the marketplace, you will also find several different food options, including Vegan cuisine. One of the coolest things about Bunbury is definitely the encouragement of social change and the culture that is open to diverse and new ideas. Techbury is the part of the event that brings sixteen up and coming Cincinnati entrepreneurs to battle it out in front of a roaring crowd and judges who will be throwing darts! Each group gets three slides and three minutes to impress the audience, who chooses who will win! The first prize winner will win $1000 and a trophy while second place wins $500. Sponsored by Possible Worldwide and CincyTech, the battle begins promptly at 1 p.m. Friday, July 13. Both 1 and 3 day tickets are available, ranging from $46-93.